Safe and secure facility including state-of-the-art dismissal system: ICS in the news! We would like to make the admissions process as straightforward as possible and to guide you along the way. Please review the admissions information and contact us for a tour today. We look forward to welcoming your family to ours. For all grade levels, a personal tour of the campus is encouraged. Interested families can begin the application process by completing the steps outlined below. In addition, for grades 6th – 8th, an interview with the Principal, Ms. Marrie McLaughlin is required before an enrollment invitation is extended. Registration will not be complete until all documents are submitted with the registration fee. Documents can be emailed to Mrs. Suzanne Portner: sp@icstampa.org or submitted directly to the front office. Once all items are received, the Admissions Committee will review the admissions profile and a decision will be emailed within two weeks of submission. Applications are reviewed on a first-come first-served basis. The registration fee is non-refundable should your family receive an invitation to join the student body. The fee is refundable if we feel Incarnation Catholic School is not an appropriate fit your family’s needs. In order for a student in any of the following grades to enter Incarnation he/she must meet the following age requirement. *For new students in all grades, a State of Florida Physical examination Form 3040 and Immunization HRS Form 680 are the official documents that are required. Parishioners who are active, contributing members of Incarnation Catholic Church, or other local, or out-of-state Catholic parishes if relocating, will be given first priority for admission into Incarnation Catholic School. In, and out of, parish tuition rates are available to practicing Catholics. Families of other faiths are welcome at ICS; a third tuition rate will apply, and all members of the school community will be instructed in the tenants of the Catholic Church. Family Service Requirement. Families are required to perform 20 hours of service to the school by volunteering at various school events and functions throughout the year. Immunizations: All students entering ICS must meet the immunization requirements set by law. Parents are required to provide proof of immunizations by submitting the blue Florida Certification of Immunization form and also provide a current physical form obtained from their child’s physician. 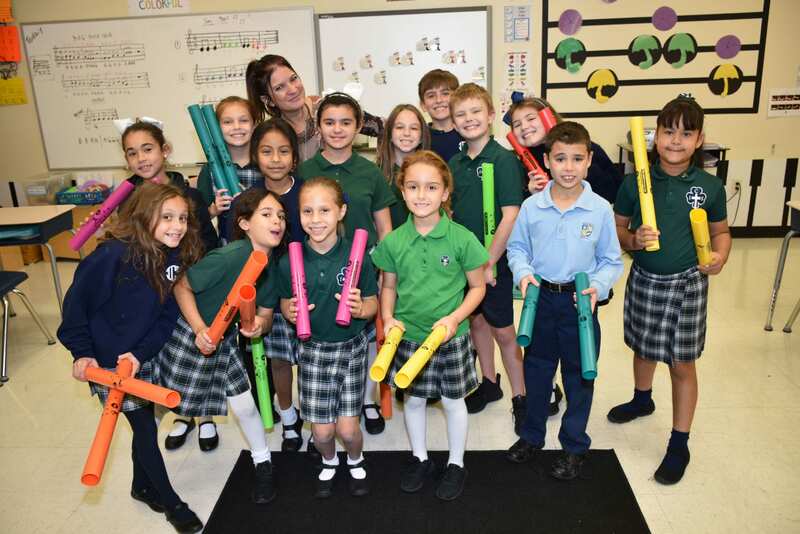 ​Incarnation Catholic School is fully accredited by the Florida Catholic Conference and holds comprehensive membership in the National Catholic Education Association. $250 registration fee per child by February 8, 2019 (Non-Refundable). $400 beginning February 11, 2019 (Non-Refundable). $400 registration fee per child (Non-Refundable). An additional $200.00 (Non-Refundable) Graduation Fee (includes Diploma, Diploma Cover, Cap and Gown, Yearbook, Admission to Graduation Dance). Unfulfilled Hours = $25.00/hour for service hours; $75.00/hour for fundraising hours. (Families may submit hours throughout the year, unfulfilled hours are billed at this rate at year’s end; families can opt to pay $800.00 to fulfill their involvement hour commitment). *More details about specifics of these hours and where/how they must be fulfilled will be included in the 2019 – 2020 Student-Parent Handbook. Before school supervision is held every school day from 7:00 AM until 7:30 AM. All students who arrive on the school grounds before 7:30 AM must be in Morning Care in St. Michael’s Hall. Students with or without parents will not be permitted to wait in hallways until the 7:30 AM bell. There is no charge for the Morning Care service. The After School Program is located in St. Michael’s Hall. It works hard to provide an enjoyable atmosphere with a variety of activities, including: homework time, arts and crafts, computer time, and outdoor and indoor play. Admission Policies​: The After School Program (ASP) is restricted to only those students enrolled at Incarnation Catholic School. Every student attending ASP must have a current ASP Registration Form on file. It is the responsibility of the Parent/Guardian to inform the school of any changes of information on the form. Anyone appointed by you to sign out your child must be at least 18 years old. Anyone not recognized by our staff will need to produce a photo ID. If you decide that your child may be signed out by another parent, the parent’s name needs to be written on your registration form or a note from you should be given to the ASP staff prior to that day. Monthly payments will be due on the first Monday of the Month (a schedule of due dates are listed below) and the weekly and daily payments will be due every Monday prior to extended care service. There will also be a day to day rate which is expected to be paid at pick-up. Incarnation Catholic School accepts Florida's Step Up For Students Scholarship, McKay Scholarship and the AAA Foundation Scholarship. We offer payment plans through FACTS Tuition Payment Program. Application packages will not be considered complete until the FACTS profile has been finalized. partners with Incarnation Catholic School to foster a sense of community and family among students and faculty.